While President-elect Donald Trump has spoken in favor of medical marijuana,pot advocates are uncertain how his administration will deal with national efforts to reform marijuana laws and how it might deal with legalized marijuana in the District. WASHINGTON — D.C. pot advocates plan to hand out joints and get stoned during Donald Trump’s inaugural address. A community group of weed smokers and growers say they will gather at Dupont Circle Jan. 20, the morning of the Inauguration, then parade toward the National Mall handing out 4,200 joints along the way. 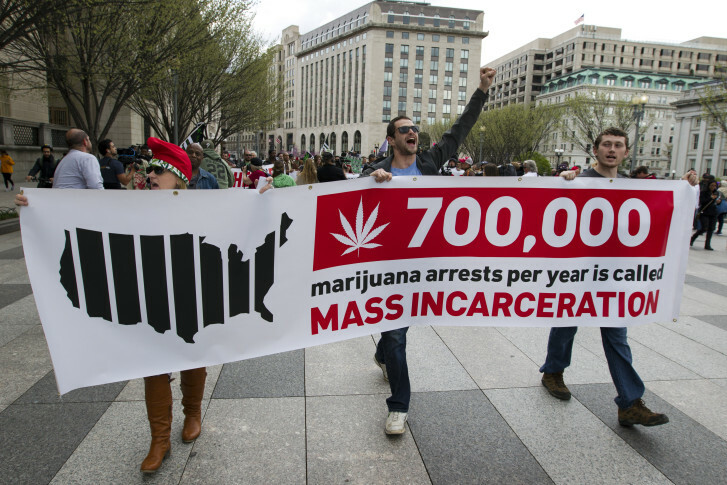 “We have to give away marijuana at the Inauguration, we have to encourage people to use marijuana during his speech,” said Adam Eidenger, who helped lead the drive to legalize pot in D.C. in a November 2014 ballot initiative. “I imagine there’ll be the smell of marijuana throughout the Inauguration,” he said. While the President-elect Donald Trump has spoken in favor of medical marijuana, Eidenger said pot advocates are uncertain how his administration will deal with national efforts to reform marijuana laws and how it might deal with legalized marijuana in the District. The activists are hoping people will light up 4 minutes and 20 seconds into Trump’s inaugural address — 420 is code for marijuana. “If you do it at 4 minutes and 20 seconds into his speech people will know when they smell it that it is a demonstration for marijuana reform,” Eidenger said.